Thankfully, the answer is no! Nonetheless, with all the beautiful paintings, drawings, and doodles circulating the bullet journal realm, it’s understandable that some people get a bit put off when their capabilities don’t match expectations. Creating good art in your bullet journal is a process that takes a lot of time and patience. It’s a bit unrealistic to think that watching a few YouTube videos will bring complex watercolor success in a short amount of time. So, where is a good place to start when you want to improve the art in your bullet journal? Very simple! You start with doodles. Why Learn with Bullet Journal Doodles? Doodles seem to have a negative vibe in society; typically associated with laziness or boredom. Some may argue that doodles aren’t proof of real artistic talent! Awesome doodles from Nerdy Flamingo shared on Instagram! Personally, that’s a ridiculous concept. They are simple to draw. They usually don’t take long to draw. It’s often relaxing and improves concentration. It helps develop foundations by learning the importance of shapes in art. You can add a personal flair through many means. Plus, you can find a doodle on literally any topic imaginable! It’s so easy to add a personal touch to any bullet journal spread with a handful of cute doodles. What if I Can Only Draw Stick Figures? Not everybody is blessed with natural artistic talent. You may find this surprising, but I cannot draw anything new without a physical source in front of me providing guidance. Having a physical source helps to visualize bullet journal doodles in real time and, at least for me, can help prevent mistakes. 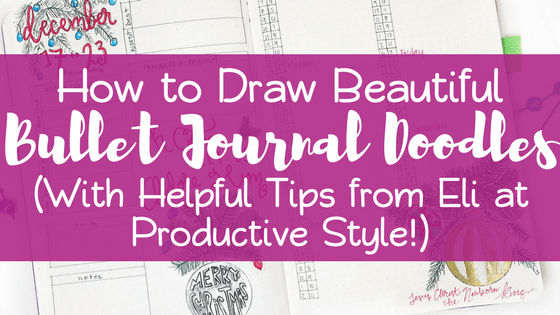 I typically get most inspiration for bullet journal doodles on Pinterest (in fact, I have an entire Pinterest board you can check out right here!). Instagram is pretty helpful, too! Doodles can be so cute! Like this one from Shayne on Instagram! But you may need some more assistance than just the doodle picture right in front of you. You may want a safe place to practice. Also, you may want the doodles broken down into smaller and easier steps. Well, thankfully my friend recognized this need for additional assistance with drawing doodles. So, she went and created an entire workbook devoted to the subject of breaking down steps and practicing. Eli Brook is a teacher, doodler, planner, and journalist. Eli is the one behind Productive Style on Instagram and a fellow member of a creative blogger group we collaborate in. Gorgeous work from Eli’s Bullet Journal! While her background is in computer science, Eli loves all things creative and is passionate about finding new ways to be productive. If you’d like to see more of Eli’s style and her bullet journal doodles, make sure to follow her Instagram account here! Eli was kind enough to answer some questions about her book and why she loves to doodle! Journaling and planning combine a two of my favorite things – creativity and productivity. For fun, I’ve spent countless hours doodling and drawing out patterns. For work, I am all for getting things done efficiently. I love to be on top of everything and have always loved the little thrill of marking things off on to-do lists and planners. I always seemed to want to switch things up though because the typical daily, weekly and monthly planners just seemed monotonous. Enter journaling and creating my own planner spreads. How long have you been doodling? I’ve been doodling my whole life, but I started practicing more over the past two years. Why did you choose to create a workbook to help other artists? During the past year and a half, I’ve gotten involved in the Instagram community. I’ve loved seeing how supportive the community is to each other. I wanted to find a way to share my love of doodles with others and thought that a doodle book would be a great way to engage! During Halloween, I got carried away with doodle how-tos (Check out @drawwithmechallenge for more!) and decided to pull together a book of doodles that included stand-alone drawings, borders, corner art, and decorative titles (Halloween Planner Doodles). Naturally, a Christmas book followed (Christmas Planner Doodles)! 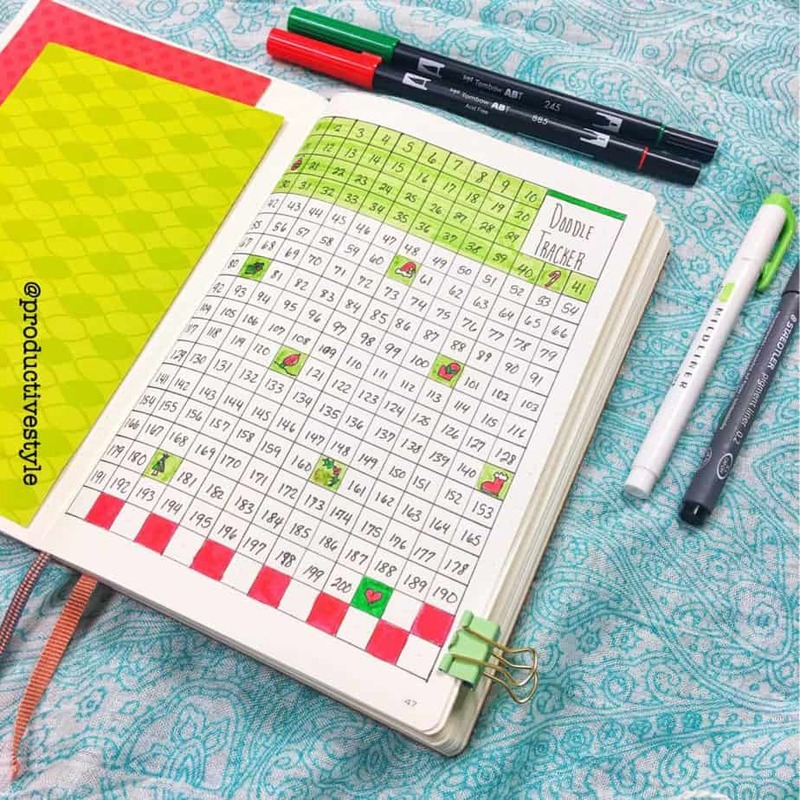 The doodles can be used to decorate journals, planners, or almost anything else or can be just for fun. 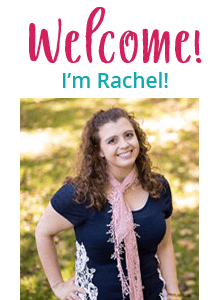 During the next year, I’m hoping to engage more with my blog, Pinterest, and YouTube as well! I’m also planning another book in the spring! Are you naturally artistic, or do you use these steps to help your own doodles? I’ve always enjoyed art and drawing. It’s something that gets better with practice. I have a tendency to break apart drawings and do plan out my doodles step-by-step regardless of whether I’m following tutorials or trying out new doodles. 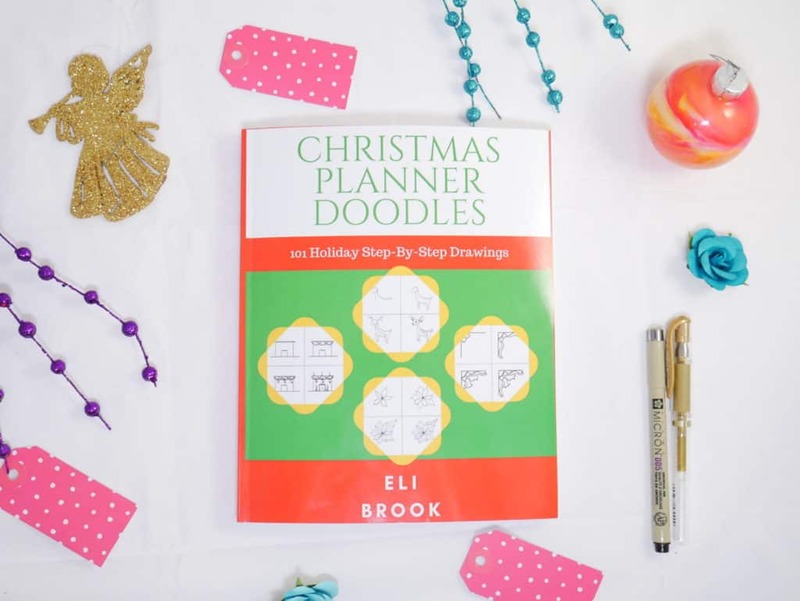 Eli was incredibly kind enough to send me a free copy of her latest workbook “Christmas Planner Doodles: 101 Holiday Step-By-Step Drawings” for me to review! I was beyond excited to get it in the mail! While I didn’t get to draw the very second I received it, I took a brief look through the pages. You can purchase Eli’s book right here! None of the doodles are complicated. The ones that require a bit more work break down into easier, actionable steps. From first glance, this book is truly a gift for beginners. The layout of each doodle is the same for each page. The left side of the page has the doodle broken down into 3-4 steps. The right side of the page has ample space for practicing the technique. I’d say the coolest part of the practice page is it’s in a dot-grid format, which is the type of notebook used for many bullet journals. It’s nice to get a feel for how it may lay out in a notebook of the same format. After a near freak accident involving my three-year-old and orange juice (thankfully, the book survived without a trace! ), I spent some time trying some of the doodles. First, I had a BLAST! Second, I decided that talking about doodling is rather difficult… so I went ahead and made a video! It’s only about five minutes, and it’s super informative. Click play, and I’ll see you down below when you’re done! After fiddling with this workbook for a day, I decided I should recommend a few tools that may provide some benefit to your bullet journal doodles along with the workbook. This is the stencil I used from “Journal This” on Etsy. It’s really nice because it offers different sizes of circles. Journal This offers a TON of other stencils, and they are lightweight and flexible. Here is the pencil from the rough draft example in the video. While not shown, I use this eraser for erasing pencil lines after I draw over with pen and marker. It’s very high quality and erases nicely without smudging the ink. Below are the other pens and markers used for the video. Click the links to see more information and to purchase! 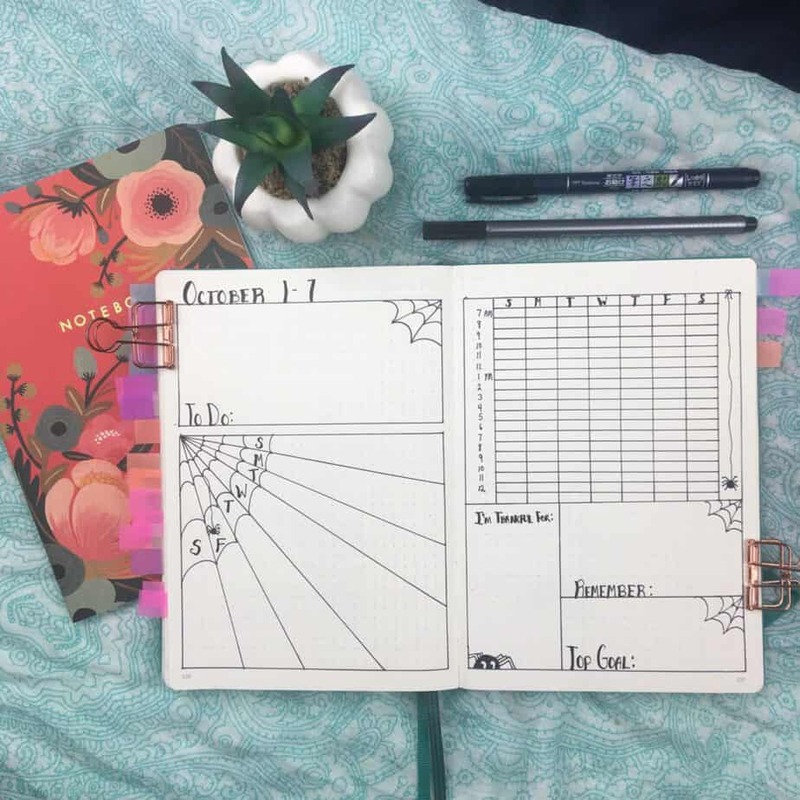 If you’d like some additional suggestions for tools that are helpful to use with your bullet journal, please make sure to read this article about my seven favorite bujo tools! 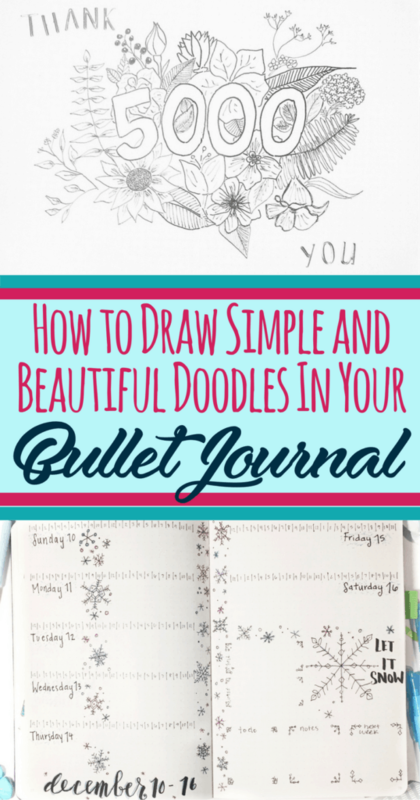 Start Making Bullet Journal Doodles! More terrific art from Eli’s account! Face it- it is scary to draw in your bullet journal when you don’t feel very confident with your art! The point of this post is to help you get more comfortable and to start small. Even the best artists had to start somewhere. Use Pinterest and workbooks (like the one in this post!) to help improve your skills. What (or even who) do you rely on to help you with your own bullet journal doodles? 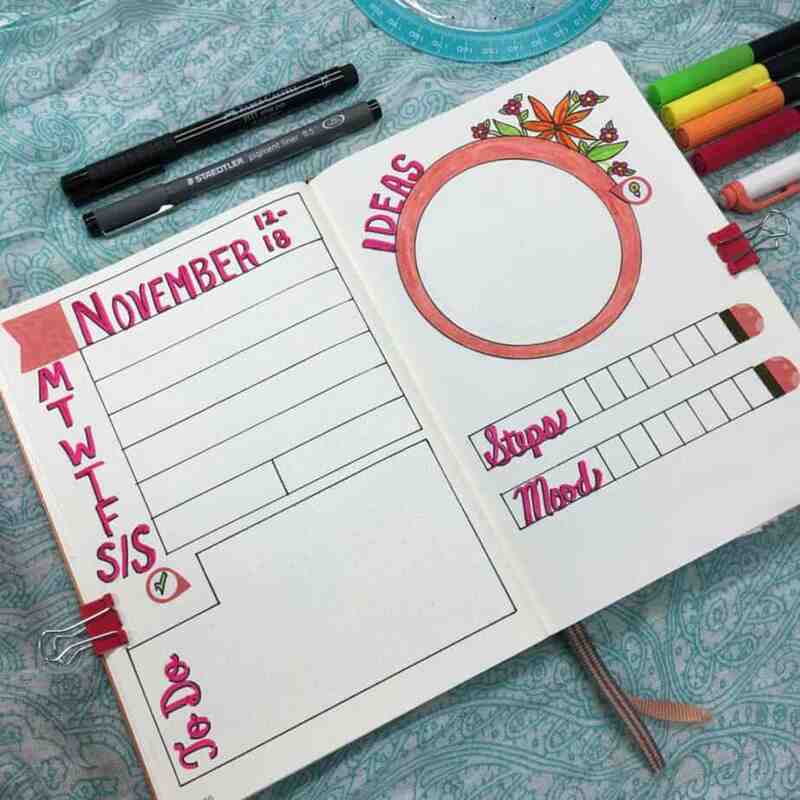 Do you recommend any other bullet journal accounts, or even other books to practice with? If so, share what you use in the comments! 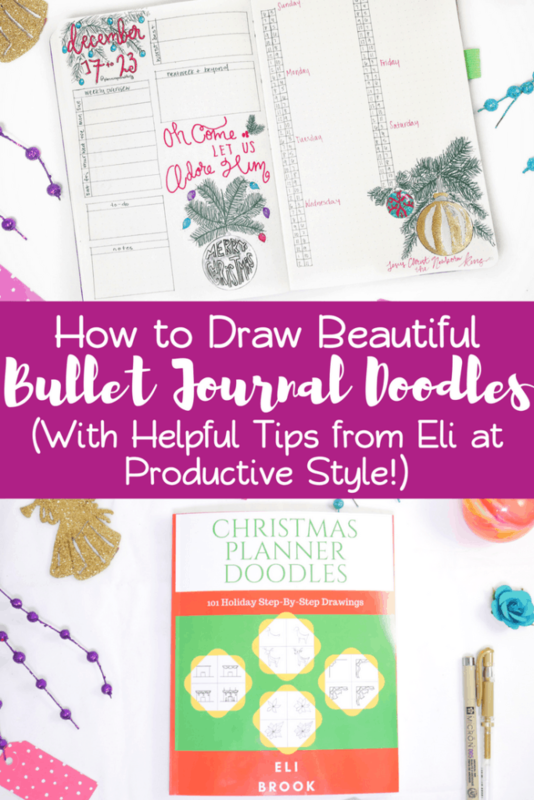 PS- If you want to see more amazing accounts like Eli who provide tons of inspiration, read 18 Inspirational Bullet Journal Accounts for 2018! If this post helped you, help others! You’re very welcome! I’m looking forward to the next workbook! Thank you SO much for bringing that to my attention! I’ve fixed it and added the links. Please let me know if that works out, and please reach out if you need anything else. Have a great Friday!